In article mentions Ohio man Kenneth Coleman who was brought back to life. He talks about seeing heaven (@ the :41 second mark in the video). October 2, 2018 - Reported [here]. Dayton, Ohio - Four people who escaped death were reunited with their medical saviors. 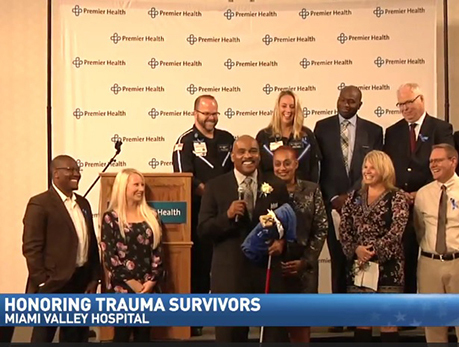 Miami Valley Hospital honored Level I trauma survivors Tuesday at their annual celebration. “I can tell you that Miami Valley came through for the Coleman family and we just thank god for them,” Stacey Coleman, whose husband Kenneth was one of Tuesday’s honorees, said. Stacey Coleman said the medical team, which included CareFlight, nurses, doctors and surgeons, helped bring her husband Kenneth Coleman back to life. “I saw a part of heaven,” Kenneth said. “I did pass away and I saw a field with beautiful flowers in it about knee high.” Kenneth was in a coma for three months and underwent seven surgeries after running into black ice and crashing head on into an electric pole in January. On Tuesday, he was honored as one of Miami Valley Hospital Level I trauma survivors for overcoming tremendous odds. “It’s awesome,” Coleman said. “I’m really privileged and honored to have this opportunity to be honored.” Kenneth was not the only one honored Tuesday for a miraculous journey to recovery. One honorary was shot in the chest by a crossbow arrow in her Hilsboro, home and another survived a life-threatening skydiving injury. Some honorees were reunited with their care team for the first time since out of the hospital. The ceremony not only honored survivors, but also families of the survivors and the work of the medical staff. "All the departments were able to assist me through the process with anything I needed at the time,” Stacey Coleman said. “I was just blown away." This is the sixth year Miami Valley Hospital honors Level I trauma survivors, families and their medical staff.